Back in 2004, recent Penn State grad Andrew Goodman’s classmates were starting first jobs when Andrew earned his real estate license, selling an impressive eight houses his first year. 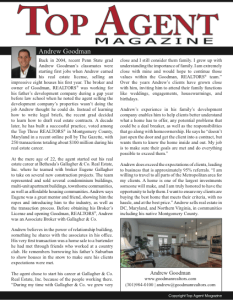 The broker and owner of Goodman, REALTORS® was working for his father’s development company during a gap year before law school when he noted the agent selling the development company’s properties wasn’t doing the job Andrew thought he could do. Instead of learning how to write legal briefs, the recent grad decided to learn how to draft real estate contracts. A decade later, he has built a successful practice, voted among the Top Three REALTORS® in Montgomery County, Maryland in a recent online poll by The Gazette, with 250 transactions totaling about $100 million during his real estate career. At the mere age of 22, the agent started out his real estate career at Bethesda’s Gallagher & Co. Real Estate, Inc. where he teamed with broker Eugene Gallagher to take on several new construction projects. The team represented and sold several condominium buildings, multi-unit apartment buildings, townhome communities, as well as affordable housing communities. Andrew says Eugene was a great mentor and friend, showing him the ropes and introducing him to the industry, as well as the transaction process. Before obtaining his Broker’s License and opening Goodman, REALTORS®, Andrew was an Associate Broker with Gallagher & Co.
Andrew believes in the power of relationship building, something he shares with the associates in his office. His very first transaction was a home sale to a bartender he had met through friends who worked at a country club. He remembers borrowing his father’s Suburban to show houses in the snow to make sure his clients expectations were met. The agent chose to start his career at Gallagher & Co. Real Estate, Inc. because of the people working there. “During my time with Gallagher & Co. we grew very close and I still consider them family. I grew up with understanding the importance of family. 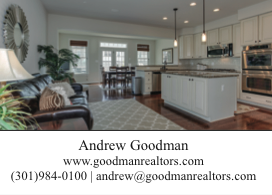 I am extremely close with mine and would hope to continue those values within the Goodman, REALTORS® team.” Over the years Andrew’s clients have grown close with him, inviting him to attend their family functions like weddings, engagements, housewarmings, and birthdays. Andrew does exceed the expectations of clients, leading to business that is approximately 95% referrals. “I am willing to travel to all parts of the Metropolitan area for my clients. A home is one of the largest investments someone will make, and I am truly honored to have the opportunity to help them. I want to ensure my clients are buying the best home that meets their criteria, with no hassle, and at the best price.” Andrew sells real estate in DC, Maryland, and Northern Virginia, in communities including his native Montgomery County.